Researchers are working with policy-makers and civil society to identify challenges and develop action strategies for European asylum and migration-related policies. For many years to come, refugees and migrants, as well as intra-EU mobility of workers will remain fiercely-debated topics in Europe. How these challenges are addressed will impact Europe’s cohesion and capacity to act. 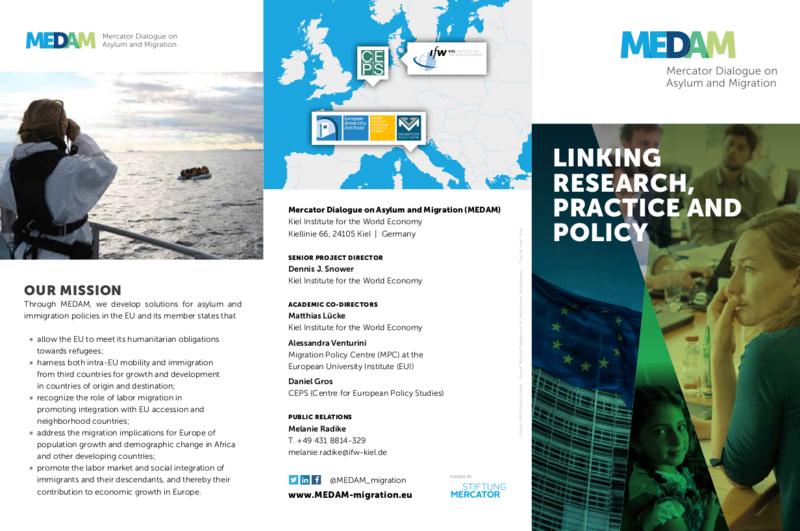 The Mercator Dialogue on Asylum and Migration (MEDAM) is a three-year research and consultation project which will aim to answer the most relevant research questions and pressing concerns of policy makers. promote the social and labor market integration of immigrants and their descendants, increasing their contribution to Europe’s economic growth. the impact of migration on countries of origin and countries of first asylum. MEDAM is at the interface between academic research and policy-making. Both, rigorous research and a regular dialogue with decision makers at national and EU levels through a variety of formats are key elements of the project. We will disseminate our findings and research-based policy recommendations through our core output, the annual Assessment Report, as well as policy briefs and research papers. In addition, we will share policy-relevant insights at major conferences like the CEPS Ideas Lab and the Think 20 Summit – GLOBAL SOLUTIONS. We plan to form a CEPS-MEDAM Task Force to involve administrators, policy-makers, and researchers in developing implementable proposals for asylum and migration policy reforms. MEDAM researchers are also participating in the T20 Task Force on Forced Migration. The T20 (Think20) is a group of think tanks from the G20 countries which have been entrusted by the German Federal Government with developing recommendations for the G20 during Germany’s G20 Presidency in 2017. The Kiel Institute is co-chairing the task force to develop proposals with a view to the G20 Summit in July 2017 in Hamburg. This meeting is dedicated to bringing together and reviewing the researchers’ findings, sharing policy-relevant insights and developing science-based, implementable proposals for asylum and migration policy reforms. Presentation of the first MEDAM Asylum and Migration Report at the Think 20 Summit GLOBAL SOLUTIONS, 29-30 May 2017, Berlin. MEDAM presents its first Asylum and Migration Report at the Think 20 Summit in Berlin, setting out challenges and priorities as the EU and its member states shift from emergency responses to discussing a more durable asylum and immigration regime. The Mercator Dialogue on Asylum and Migration (MEDAM) is funded by Stiftung Mercator. Copyright © 2019 Migration Policy Centre – MPC. All Rights Reserved.